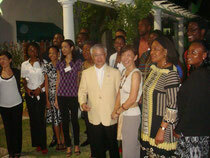 There was JET and scholorship member's send-off reception 2011 at ambassador residence on last week Friday.They are starting on new journey to Japan. Their face brightened up with joy like diamond. Fly high young ambassadors!! Ganbattekudasai.